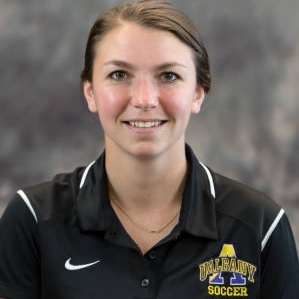 Former professional player Ashley Grove has joined the UAlbany women’s soccer team as an assistant coach starting in the 2016 season. Grove has played professionally the past three years, last playing for Herfoder SV of the Frauen Bundesliga in Germany. Previously, she spent two years in the National Women’s Soccer League (NWSL), playing with the Boston Breakers in 2014 and the Western New York Flash in 2013, helping the latter to the NWSL regular season title that year. Grove holds a Class E New York State West coaching license. She was the head coach of Soccer Shots in her native Rochester for boys and girls aged 2-8 in 2016. She also served as a soccer coach for Doug Miller Soccer in 2013 as the head coach for U10 Girls and an assistant coach for U16/17 Girls, developing and implementing practice plans and running individual sessions. Her coaching career began as an undergraduate assistant coach for her alma mater, the University of Maryland, in 2012, working primarily with the front four/six as well as helping in the training of goalkeepers. Maryland earned a spot in the Atlantic Coast Conference title match and reached the NCAA Tournament Second Round that year. Grove graduated from Maryland in 2012 with a degree in kinesiology. In 81 games played at forward from 2008-11, she finished with 23 goals and 18 assists, helping the Terrapins to three NCAA Tournament berths, including trips to the Round of 16 in 2009 and 2011. As of 2016, she ranks in the top-8 in goals, assists, total points and game-winning goals in Maryland history. She was a National Soccer Coaches Association of America (NSCAA) All-American in high school at Aquinas Institute in Rochester.